Today I’m welcoming one of my favourite JAFF authors to talk about her latest project, which is both surprising and exciting for me. Victoria Kincaid joins me at From Pemberley to Milton to discuss President Darcy, a modernization of Pride and Prejudice, and brings with her an excerpt and giveaway! Although President Darcy is my first modern Pride and Prejudice variation, the idea for it has been germinating in my brain for a long time. Still, I wasn’t prepared for how different it would be to write a version set in the present day. I thought it would be easier; after all, I didn’t need to worry about violating some obscure Regency tradition or describing a carriage by an incorrect name. What I found, however, is that modern variations are difficult in other ways. When I write a Regency era adaptation, one of the challenges is to stay true to Austen’s characters and world while writing something new. The modern setting gave me more freedom to stray from Austen’s original concepts, but that also meant I had more latitude to alter other things in the book. In other words, there were more choices to make—and everything still needed to fit together as it did in Pride and Prejudice. In a modern context it didn’t make sense for Collins to be a clergyman, but what profession would work for him? Catherine de Bourgh couldn’t be a Lady, so what reason would she have for feeling superior? But other elements of character needed to remain the same. Collins might not be foolish for precipitously proposing to Elizabeth, but he needed to be foolish in other ways. Wickham can’t claim Darcy denied him a “living,” but he needed to be aggrieved for another reason. As I began to write I realized every character in the book needed a new profession and new motivations for their actions. Another challenge was finding modern day equivalents for Regency customs and institutions. For example, today we’d go home or to the hospital if we got sick at someone else’s house. But Jane needed a reason to stay overnight in the White House—and to require Elizabeth’s company. The Gardiners and Elizabeth aren’t going to drop by for a tour of Pemberley (now a house in the Hamptons), so they needed some other way to encounter Darcy and get invited to see the house. Wickham can’t cause a scandal just by spending a night with Lydia in a hotel; they needed do so something much more shocking. However, what I found was that when I solved these issues, it usually enriched the story and took it in a new and better direction. For instance, Collins became an employee of Catherine de Bourgh’s who is slavishly devoted to her office supply company. His self-importance manifests itself in long-winded discussions of hole punches and the relative merits of different kinds of number two pencils. He sees himself as the crown prince of staplers. Not only did that make Collins up-to-date, but he was still stupid. I have tried to remain true to the spirit of Austen’s book—to find modern equivalents for her brilliant characters and plot points. When you read President Darcy, I hope you feel that I succeeded. Elizabeth froze in horror while Lydia and Maria shot her amazed looks. Would he tell Hilliard about the broom closet? Elizabeth stumbled further into the alcove until she couldn’t see the men anymore. Lydia convulsed in silent laughter, her hand stuffed in her mouth to muffle the sounds, while Maria gaped at Elizabeth, wide-eyed. Elizabeth reviewed the words in her head, but they remained the same. Yes, the president—the president!—thought she was ugly and stupid and had voiced the sentiment out loud. “Enough, Bob.” The president’s voice brooked no disagreement. The conversation was over. He straightened his jacket. “Now, if you’ll excuse me, I have some governing to do.” As the president started to walk, the whole group of men moved en masse down the hallway. Soon they were gone. Elizabeth remained frozen in the alcove, plastered against the wall. She probably should have bolted for the exit, but her muscles felt loose and unattached as though she might fall to pieces if she tried to move. Finally, Lydia grabbed her arm, pulled her through the ladies’ room door, and pushed her up toward the sinks. “OMG! You just got dissed by the president!” she laughed. “She’s not that pretty.” Maria imitated the president’s precise tones perfectly. First the closet, now her father, and then this… Was it possible to induce a heart attack through accumulated mortification? Her chest ached, and she couldn’t catch her breath. “What did I do to deserve that?” she wondered aloud. Great. The group of people in the know included Ryan, whoever he was. “Maybe we should go back to the East Room. Dinner will be ready soon,” Elizabeth said. Perhaps she should slip discreetly out the back door, but that seemed cowardly like she was allowing his rudeness to chase her away. Instead, I should stay and show the president I’m not vapid and unattractive. Even if he doesn’t know I overheard him. As revenges went, it was rather feeble, but it was all she had. “By all means, tell everyone you can find,” Elizabeth remarked dryly. As they opened the bathroom door, Elizabeth scanned the corridor, but it was empty. “You don’t really mind if we tell everyone, do you?” Lydia asked breathlessly as they hurried toward the East Room. “I feel better already,” Elizabeth mumbled. “Twitter—!” Elizabeth sputtered. But Lydia and Maria had already disappeared into the crowd, no doubt in search of a greater audience for the tale of Elizabeth’s humiliation. Elizabeth ambled around the edges of the room, avoiding eye contact and seeking a dark corner. It’s not like I ever thought of myself as a great beauty, so that part shouldn’t rankle. He doesn’t know the first thing about my intelligence or conversational abilities. He’s just making assumptions. Most people would get tongue-tied when caught in a White House broom closet. Arrogant jerk. Of course, most people wouldn’t get caught in a White House broom closet. Maybe that did say something about her…. No. It would be stupid to get upset. 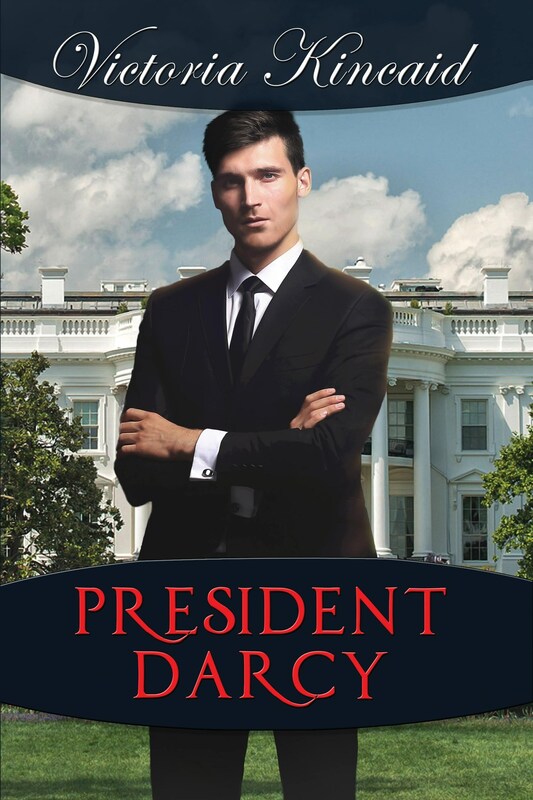 Victoria Kincaid would like to offer 1 copy of President Darcy to one of my readers. All you have to do to enter the giveaway is leave a comment on this post until the 22nd of October. The giveaway is international and the winner will be announced shortly after. If you don’t want to miss the announcement of the winner, and therefore miss the opportunity to see your name there and seek your prize, please follow From Pemberley to Milton. By doing so you will receive an email every time a new post is published and will not miss your prize if you are the lucky winner. I’ve read a few of Victoria’s books and loved them all. Would so love to read her newest publication!!! President Darcy sounds a LOT better than Donald Trump for sure. Hi Priscilla, I’m good Darcy sounds good to you! Good luck with the giveaway! Thanks Rita for hosting this new launch. Thanks to Victoria for the generous give-a-way. I loved the excerpt… in this day and age we truly understand the power of the tweet. Our Lydia has no idea what she has just started with that tweet. Poor Elizabeth… I can’t wait to read this. I am so looking forward to this. Hi JW, I’m glad you were intrigued by the excerpt! Good luck with the giveaway! Hi Glynis, I really feel for Elizabeth in this scene. Good luck with the giveaway! I actually thought Lydia was very funny Glynis 🙂 I think I’ll like her character in this book. President Darcy sounds fabulous, and the characters in the excerpt are true to their character. I am sure it was a challenge to make the 21st century changes to the character and place. Oh, I think that twitter will continue to play havoc in this novel. Thank you for the excerpt and giveaway. Hi Eva, I really tried to keep the characters true to the spirit of the original. I’m glad you think I succeeded! Wow, excellent excerpt! I wonder if Darcy will read those tweets or hear about them somehow! I am so curious to read more! I love your books, Victoria, and I am happy you are writing moderns too. Thank you for the giveaway and congrats on the new book! Hi Daniela, I’m so happy you enjoyed the excerpt and thank you for your congrats! I think that even if he doesn’t read that tweet, Elizabeth will find a away to let him know how wrong he was! I like this idea of combining modern politics with P&P – Darcy as President, that’s definitely an interesting notion! Hi, It’s an idea that wouldn’t leave me alone until I wrote it! Good luck with the giveaway! My goodness…Lydia and Twitter…a deadly combination! No longer gossip in a small community but worldwide! Poor Elizabeth! President Darcy has a lot of humble pie to eat! Congratulations and thank you for a chance at the giveaway! Hi Carole, Yes, Lydia could be deadly on Twitter! Good luck with the giveaway! What about Mrs. Bennet and aunt Phillips on twitter?? Wouldn’t that be a good joke? I wonder if Vitoria explored that possibility on this one. Oh my! I absolutely love the premise and can’t wait to read this! Would love to win! Hi Laura, I’m glad you enjoyed it–and good luck! Lol, sounds like a fun read, Victoria. Congratulation on your Modern P&P variation, I’m looking forward to reading it. Hi Kate, Thank you. I’m glad you enjoyed the excerpt! Victoria, I look forward to reading how you resolved your modernization conundrums. Really love your giving Collins the career in office supplies! He could probably bore someone for hours regarding the benefits of different pencil lead widths. Hi Ginna, You’re exactly right! He bores everyone to death talking about staplers and hole punches. I agree that was the best choice for Collins Ginna! I bet he’ll be as funny as Austen’s Collins. Loved the excerpt. I’ve never read a story with this premise before so I’m looking forward to it. I’d never read that premise before either, so that’s why I decided to write it! I can’t wait to see how this all plays out. I love the idea of Darcy being president. Hi Amanda, Thanks for your interest and I hope you enjoy the book! I do want to read this…sounds amusing. Foot in mouth disease let loose. Hi Sheila, Thank you for your interest and good luck! I did buy the book and read it but still have to post a review. Oh my! I look forward to reading where this goes. I am quite curious about this unique twist. President! Hi Becky, Thank you for your interest and good luck with the giveaway! Goodness, the Bennet girls with access to the internet? That’s a scary perspective! Yes, particularly Lydia! Good luck with the giveaway! Imagine if it was their mother!! Oh boy! Lydia and her tweets… poor Elizabeth! Can’t wait to read read your newest release. Hi Dung, Thank you for your interest and good luck! Technological paradise-that’s where Lydia resides with her instant gratification,by means of Twitter! How is Darcy ever to apologise for his remarks,how is he to ingratiate himself with Lizzy and how is this modern romamce going to play out in this setting? Victoria,I can well imagine the inherent difficulties you experienced penning this modern variation. However,I’m looking forward to discovering what choices you made in determining how each character used their own unique personality quirks to add to the general mayhem,misunderstandings and miscommunications that we all love to read about! Sending you warm wishes for success with this book and in your future endeavours! Hi Mary, Thank you for your lovely message and good luck with the giveaway! OMG! The Bennet’s on social media! Lol! Darcy always gets my vote, this modern story sounds good!! I’m always glad to discover a new P&P storyline. Haven’t read anything like this before! Thanks for the giveaway! Another Victoria K. book? Yipee. . .even if it is a modern, I’m up for it, thank you very much.